On January 16, 2019, Jeralyn Lawrence, Founder and Managing Partner of Lawrence Law, welcomed Watchung Mayor, Keith Balla and other guests for a ribbon cutting ceremony to celebrate the grand opening of Lawrence Law. Located at 776 Mountain Boulevard, Suite 202, Watchung, NJ, Lawrence Law is a boutique family law practice offering a full range of matrimonial and divorce legal services. Attorneys at Lawrence Law include Rita M. Aquilio, Daniel A. Burton, Kristyl M. Berckes, and Ashley E. Edwards. “Thank you, Mayor Keith Balla for taking time out of your busy day to join us! I have lived in the beautiful town of Watchung for many years and am thrilled to have opened my own law firm in the place I call home. I am excited to become even more involved in our local business community and initiatives.” said Lawrence. 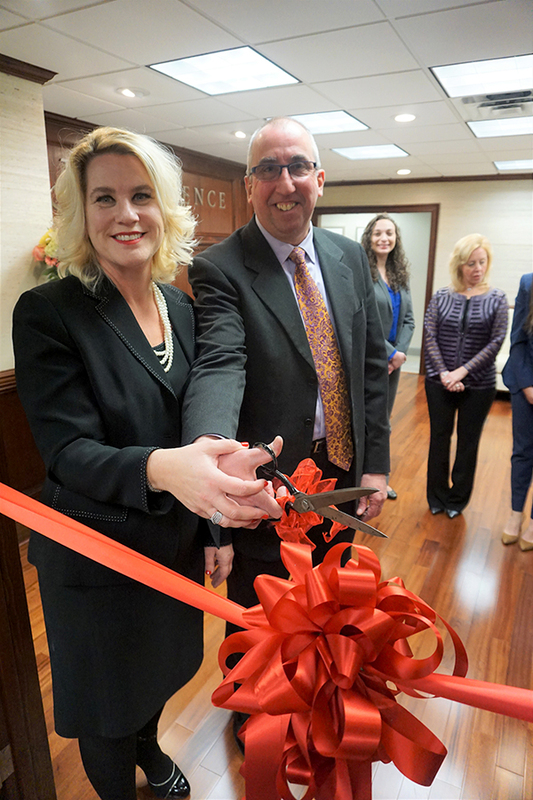 (above) Jeralyn Lawrence, Founder and Managing Partner of Lawrence Law, and Watchung Mayor Keith Balla cut the ceremonial ribbon during a ceremony to celebrate the grand opening of Lawrence Law.